Fine Gael TD for Wicklow and Minister of State, Simon Harris yesterday (Thursday) organised a tour of Leinster House for 4th, 5th & 6th class pupils from Avoca NS and St Mary’s NS Barndarrig. 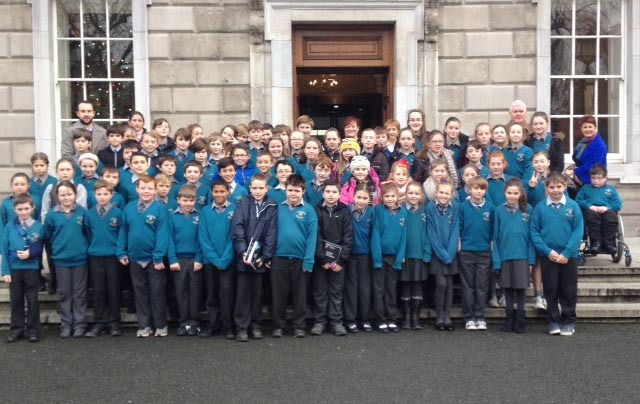 The students from both schools visited Leinster House yesterday morning with their teachers. Speaking from Leinster House yesterday morning, Minister Harris stated, “I was delighted to organise for two Wicklow schools to visit the Houses of the Oireachtas today. It is hugely important that children in our schools understand how the Irish parliamentary system functions and to see their public representatives at work. “During their visit, I was speaking in the Seanad on the Finance Bill, in my capacity as Minister of State at the Department of Finance. I was very pleased that Avoca NS and St Mary’s NS Barndarrig were able to watch these proceedings today as this is a very significant Bill for our country. “Since my election as TD for the constituency I have greatly enjoyed meeting with many primary and secondary schools here in Leinster House. I look forward to meeting many more Wicklow schools during the course of this academic year,” concluded Minister Harris.